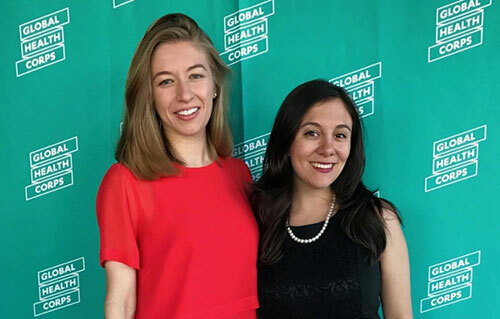 Jenna Zitaner (Medill ’15) and Odette Zero (WCAS ’17) have been named to the 2017-8 class of Global Health Corps fellows! From nearly 5,300 applicants, Odette was selected as one of the 140 fellows who comprise the ninth class of Global Health Corps fellows. This cohort represents a wide range of backgrounds and sectors. Fellows hail from 16 different countries and collectively speak 42 different languages. Working with 64 partner organizations in Malawi, Rwanda, Uganda, the U.S., and Zambia, fellows will make an impact in areas ranging from family planning to global-health-policy advocacy. Jenna grew up just north of New York City, in Westchester County. She graduated from Northwestern University with a BS, majoring in journalism and minoring in global health studies. During her undergraduate years, Jenna interned with Facebook’s communications and public policy department. Prior to joining GHC, Jenna spent nearly two years at Burson-Marsteller, a global public-relations firm, where she counseled a range of healthcare clients in crafting and executing their communications strategies. Jenna has been a volunteer advocate with Mount Sinai’s Sexual Assault and Violence Intervention Program, acting as a crisis responder to emergency departments in Manhattan and Queens. During her fellowship year, Jenna will work for DotHouse Health in Boston. Odette is from Zionsville, Indiana. At Northwestern, she majored in anthropology (with a concentration in human biology) and minored in global health. Odette co-founded and directed the Community Health Corps, a student-run community-based organization that improves access to health resources through partnerships with public libraries in Chicago. After volunteering at Open Windows Foundation for years in rural Guatemala, she conducted anthropological research on diabetes illness narratives, local barriers to care, and culturally relevant management strategies. Her research experience includes analyzing illness narratives of indigenous Peruvians and interviews from Hispanic adolescents receiving psychiatric care in Chicago. At Jagran Jan Vikas Samiti in India, a traditional medicine NGO, Odette created a book highlighting healers’ life stories and a crowd-funding campaign to build a local health center. During her fellowship year, Odette will work for the Children’s Health Fund in New York City. Contact Amy Kehoe today at amy.kehoe@northwestern.edu for more information about the Global Health Corps!